For many years after my 1981 graduation from Valparaiso University, I regarded my student days as spanning one of the duller stretches of U.S. history. As a late Baby Boomer, I had missed out on the Sixties experience, and the decade that followed seemed comparatively tame and banal. The overall state of politics and public affairs fueled much of that impression, but so too did popular culture (Captain & Tennille, anyone?) and the everyday experience of campus life. The gift of hindsight, however, reveals a period of significant transitions that anticipated major things to come—for my own life, for VU and higher education generally, and for national and international affairs. This epiphany crystallized for me during an extended visit to Valpo last fall to participate in Homecoming-related activities and to work on a book project as a visiting scholar at the School of Law. As a creature of nostalgia, an amateur student of politics and history, and a long-time denizen of higher education, all systems were primed for a flood of collegiate memories and mid-life reflections. To the extent that such a retrospective may invite others of my age group to consider the times of our lives, I share some of it here. My 2016 return to VU was an unlikely reunion, at least from the vantage point of my original departure. True, even as a callow undergraduate, I knew that Valpo was providing me with a quality education. It also offered meaningful extracurricular opportunities and a chance to study abroad. However, I was given to sharply criticizing the institution, especially in my role as a department editor and reporter for the Torch. By the time of my graduation, several critiques had hardened into grievances. I left VU smugly assuming that I had outgrown the place. Led by a perceptive group of editors-in-chief whose voices were honed by deep immersion in VU’s Christ College honors program, the Torch editorial board of the time was committed to taking VU to task for the institution’s supposed inadequacies. Among other things, the paper criticized the steady creep of vocational influences that threatened the liberal arts, called out the behavioral excesses of campus fraternities, and pressed the school to be a more inclusive place for women and various diversities. Looking back, it’s clear that we were digging into early editions of topics that continue to challenge and shape higher education today. As for my contributions to the paper, I mixed some good reporting and commentary with several sophomoric, over-the-top salvos, the latter of which remain quite horrifying to read now. That said, those of us who spent significant time in the Torch’s offices benefited greatly from the experience. We learned a lot about good writing, we frequently debated the condition of VU and the school’s possible future, and we engaged in spirited discussions about our responsibilities as student journalists. One might not imagine working on a student newspaper as being an intellectual endeavor, but it served that role for us. On the whole, the Torch of that period blended hard-nosed coverage of campus events and university life with an editorial voice that could be spot-on when it wasn’t undermined by a self-righteous tone. Many of the sharper commentaries were aimed at a school that was wrestling with its self-identity. VU circa 1980 featured a faculty deeply committed to classroom teaching and undergraduate education, despite heavy course loads and modest pay. However, the school didn’t know where it stood in the landscape of American higher education beyond its Lutheran constituency, and it lacked a presence in national circles. I would internalize some of that institutional insecurity. During my semester abroad at VU’s study center in Cambridge, England, I met students from schools such as Brown, Johns Hopkins, and UC Berkeley, and I assumed that everyone who attended such elite schools were brilliant thinkers and writers. These self-doubts followed me when I decamped for law school at New York University, where many of my classmates had earned bachelor’s degrees from elite colleges and universities. Not until I returned to NYU as an instructor in its legal skills program would I understand, by reviewing the work of first-year law students, that my Valpo education compared very favorably to that of tonier undergraduate schools. As for the social options, Greek organizations pretty much dominated the scene, with fraternity behavior inspired (if that is the word) by the 1978 hit movie Animal House. In a 1989 Cresset remembrance sharply critical of the quality of campus life during that time, former Torch editor-in-chief Jeff Smith lambasted a fraternity culture rife with “street fights, screaming matches and joint public displays of urinating,” along with serious instances of sexual harassment and violence. Smith’s regard for VU was distinctly bifurcated. He held certain VU administrators responsible for overlooking these behaviors, tagging them “the Lackeys.” But he praised the university’s teachers for their instruction and mentorship and hailed the Christ College core curriculum for its intellectual content. Race relations, always a hard topic in a predominantly white northwest Indiana community, became prominent in a terrible way. One night in December 1979, two male students at VU, one African American, the other white, got into a vicious fight near the latter’s fraternity house. It was the latest in a series of racially infused antipathies between them, culminating in the stabbing death of the white student. An eventual trial would result in a murder conviction. I covered this event and its aftermath for the Torch, and it affected me deeply. I learned that during the night of the stabbing, some black students feared for their safety; a number of them sought refuge with faculty members. I interviewed others who expressed anger and sadness over the general climate for minority students. While I did not condone the criminal act, I began to view the underlying circumstances against the backdrop of VU’s overall record on diversity. I resented the school for not doing more to address racial tensions on campus. Had I been more confident and constructive about pursuing these matters, I might have discovered possible resources for that potential “more.” Many years later, for example, I would learn about the work of professors Andrew Schulze and Karl Lutze, whose leadership of the Lutheran Human Relations Association of America during the 1950s and 1960s supported racial inclusion and civil rights on campus and in the broader Lutheran community. This led me to wonder what stronger initiatives could have been taken to help the VU community heal and grow in the aftermath of this tragedy. In any event, I opted to leave Valparaiso from afar, spending my final semester in Cambridge. This deeply formative experience would positively shape my worldview, intellectual base, and personal culture for a lifetime. It also brought together students whose paths were unlikely to cross on the VU campus, often with unexpectedly gratifying results. Our group included members of the very Greek letter organizations that I had roundly criticized as a Torch staffer. Several forgave my standoffish attitude and kindly invited me to travel with them during our various breaks. Their outreach opened the door to friendships that have continued to this day. Two events later in the decade would help to enhance VU’s self-esteem and provide it with overdue national recognition. 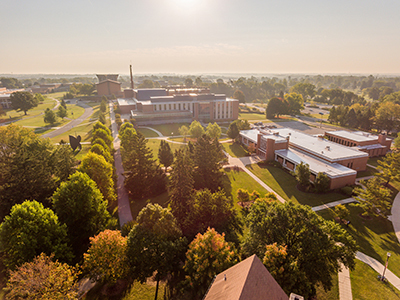 First, in 1987, U.S. News & World Report published the first of its annual rankings of colleges and universities, and Valparaiso began its continuous run of being ranked among the top regional schools in the Midwest. Before the advent of the U.S. News rankings, questions of institutional prestige were left largely to conjecture and self-promotion. While occasional surveys attempted to rank or identify the nation’s most prestigious colleges and universities, everyone else was left to guess as to where they stood in the remaining hierarchy. Although I would argue that the U.S. News rankings have had an overwrought and often negative impact on higher education, for Valparaiso their appearance served a validating purpose, soothing some of the self-doubts about its standing among peer institutions. A year later, the American Scholar, journal of Phi Beta Kappa, would publish an essay by VU alumnus, faculty member, and Cresset editor James Nuechterlein, “Athens and Jerusalem in Indiana,” which examined VU’s history under Lutheran stewardship and its place in the current higher education landscape. The essay’s title invoked the late VU President O.P. Kretzmann’s metaphor of the Christian university standing “at the crossroads of Athens and Jerusalem,” capturing a fusion of higher education and faith. Nuechterlein recognized the challenges that VU faced in integrating intellect and faith, liberal arts and professional training, and faculty teaching and scholarship. He also foresaw growing tensions concerning politics and diversity on America’s campuses. We can only guess as to the article’s actual number of readers. Although the American Scholar can be found in many well-stocked magazine sections of larger bookstores, obviously its market appeal is much narrower than that of, say, Time, Sports Illustrated, or Vogue. Nevertheless, this thoughtful, contextual piece served as something of an intellectual coming out party for Valparaiso, signaling to the higher education community that VU merited a serious profile in a prestigious journal for a general audience. We were not aware of it at the time, but those of us attending college during the late 1970s and early 1980s witnessed the emergence of national and international megatrends that would endure through our adulthoods. The New Deal liberalism that had shaped domestic policy debates for decades was about to be challenged by a resurgent conservative movement that emerged full force in the form of Ronald Reagan’s election in 1980. And while the Cold War continued to dominate international relations, another part of the world would compete for significant attention. Consistent with my sometimes contrarian nature, my own political beliefs were heading leftward at the time. I had entered VU as a nominal Republican. By the time the 1980 presidential campaign rolled around, I had given my electoral affections to John B. Anderson, a Republican congressman from Rockford, Illinois, whose own political journey had moved from right to left. Running as a maverick liberal, Anderson made a big splash in the early GOP primaries before losing steam during the spring. He then decided to run as an independent candidate, with plans to stage a national campaign. I served as the northwest Indiana coordinator for Anderson’s independent candidacy during the summer and fall of 1980. Tasking this assignment to a VU undergraduate spoke volumes about the green political talent the campaign had to rely on in certain parts of the country. Our largely volunteer operation in Indiana managed to get Anderson and his running mate, J. Patrick Lucey, a former Democratic governor of Wisconsin, on the state presidential ballot. This surprisingly herculean task—Indiana’s election laws tossed major obstacles in front of third-party presidential candidates—would constitute our biggest organizing success. Anderson went on to post strong double-digit national support in polls during the summer, but he finished with just under 7 percent of the popular vote. Today his campaign is regarded as something of a political footnote, but I suggest that his decision to pursue an independent candidacy served notice that moderate and liberal voices would be increasingly unwelcomed in the GOP. Furthermore, the final results that fall—the election of Ronald Reagan and the ouster of dozens of liberal Democrats in the House and Senate—created an early foundation for the triumph of Donald Trump and the Republicans in 2016. Political changes were joined by economic ones. The Class of ’81 would graduate into one of the worst recessions of the century. Those of us from northwest Indiana would confront a local economy wracked by a steel industry in decline, a sign of the nation’s shifting labor market and another harbinger of things to come. The Great American Jobs Machine was showing its age, and no longer would it provide a robust supply of well paying, union-secured jobs in the manufacturing sector. The major unanticipated societal transformation was the coming digital age, even though it was right on our horizon. For most VU students, computers remained a novelty, housed in huge mainframes. Across the campus, handwritten drafts of papers followed by final versions painstakingly typed out the night before they were due made for a widely shared student ritual. Communications were similarly in analog mode. When we parted company for summer and semester breaks, we kept in touch via snail-mailed letters and occasional phone calls. As domestic politics and economic policy bubbled anew, so did the global scene. The Cold War remained the dominant foreign affairs paradigm during our Valpo years, with the Soviets regarded as America’s main adversary. However, in November 1979, young Islamic revolutionaries seized the U.S. Embassy in Tehran and took several dozen American hostages, thus starting what quickly became known as the Iranian Hostage Crisis. The Middle East, long on America’s radar because of its oil supply, was now an active conflict zone. Every weeknight, millions of Americans watched ABC’s Nightline news program, hosted by Ted Koppel, to learn of the latest attempts to free the hostages. In our Valpo dorm rooms, we tuned in nightly for updates on small black-and-white televisions and then debated the impact of these developments on the upcoming election. The captors released their hostages in January 1981. I was in Cambridge by then, and some of my classmates hung a marked-up cloth sheet proclaiming “God Bless Our Freed 52” outside a bedroom window. Of course, we were babes in the woods in terms of comprehending the future of terrorism. We still presumed that whenever American hostages were taken, they very likely would be freed. And if gunmen were to hijack a commercial airliner, we assumed that a forced landing in another country was the worst thing that could ever happen. When I jump to today, I see a world more divided and unstable than it was around 1980, with the twist being that the current state of affairs has roots in many events of that time. My extended visit to VU overlapped with an ugly and vulgar presidential campaign; watching the debates in my Valparaiso hotel room was a distressing and depressing experience. The international scene overall is an angry one that makes me wonder if we learned much from the suffering of the last century. And while it is premature to suggest that we add Sparta to O.P. Kretzmann’s Athens and Jerusalem in terms of framing our earthly existence, I fear that some who hold power would be happy if occurrences compelled us to do so. I now understand that VU and I were more of a matched pair during my undergraduate years than I ever could have guessed. While Valpo was dealing with its identity crisis, I wasn’t all that sure of myself, either. My political and social beliefs were in a state of flux, and for all my criticisms of VU’s record on diversity, I wasn’t very worldly in my own right. My collegiate years felt heavy, as if I was carrying the weight of the future on my shoulders, fueled by a growing desire to explore life outside of my native northwest Indiana and anxiety over where I would end up and how I would fare once I got there. When I returned to campus last fall, I encountered a university that was more cosmopolitan, inclusive, and comfortable in its own skin, while still holding true to its Lutheran heritage. The student body appeared more visibly diverse, and the university had built an array of much-needed new facilities. Moreover, the City of Valparaiso felt more like a college town, as opposed to being a town simply abutting a university. I came away believing that VU has good reason to be optimistic about its future, a distinction that many schools cannot legitimately claim these days. It has not escaped all of the major challenges facing modern higher education, but it is greeting them with a confidence not necessarily evident during my student days. On this point I can relate. While I, too, remain a work in progress, thankfully I am more confident at middle age than I was as an unsure undergraduate. Questions about the future that beset me in college have been largely supplanted by a strong sense of purpose in my life. Maybe that explains why, during a visit to the alumni hospitality tent at the Homecoming football game, I remarked to VU President Mark Heckler that it felt very light to be back on campus—a stark contrast to my emotional heaviness back in the day. When I informed friends that the VU Alumni Association would be honoring me with an Alumni Achievement Award during Homecoming, several noted the humorous irony of the critical Torch writer returning to campus decades later as an appreciative award recipient. Many of them—mostly fellow sojourners from our wonderful semester together in England—would join me for the awards ceremonies, including a Sunday service in the Chapel of the Resurrection and a luncheon in the new student union. Our impromptu reunion reminded all of us that lasting friendships have been among the continuing gifts of our college experiences. This Homecoming assemblage and other get-togethers with fellow VU alums have clarified another epiphany for me. Currently the higher education industry is positively obsessed with “assessments” and “outcomes,” educational jargon for figuring out what students learned. Well, here’s a longer-range outcome for colleges and universities to consider: How are your graduates turning out in life? If my friends are any indication, then Valparaiso can stand proud on this measure. They have turned out darn well, in myriad ways. Amid differences in life choices, family arrangements, political views, incomes, faith traditions, and vocational paths, they are grounded people leading good and meaningful lives. Some have met significant challenges with courage and determination. We cannot change the past, but subsequent events, new understandings, and mature reflection can change how we regard it. It took me many years, and some negotiation, to recognize VU as my alma mater in the truest sense of the term. Today I am grateful for this renewed and positive relationship, which includes a quality education of lasting impact and a cohort of treasured, lifelong friends. After all, in a world more uncertain and fractured than it was some thirty-five years ago, we need these healthy human and institutional connections to help us navigate it. David C. Yamada is a Professor of Law and Director of the New Workplace Institute at Suffolk University Law School in Boston. Baepler, Richard. Flame of Faith, Lamp of Learning: A History of Valparaiso University. St. Louis, MO: Concordia Publishing House, 2001. Smith, Jeff. “Great Books, Great Ironies: Personal Reflections on the Perils of Incollegism.” The Cresset (April 1989): 5-11.